This handsome, major, twin-towered apartment building at 101 West End Avenue was a development of Tishman Speyer Properties, one of the city's most distinguished real estate concerns whose properties include Rockefeller Center and the Chrysler Building. The 34-story building, which is known as Archstone 101 West End, is rent-stabilized and many of its apartments have spectacular views of the Hudson River, midtown, and the nearby Lincoln Center District. It is just to the south of Donald Trump's sprawling Riverside South development, the lower half of which he sold to Extell Development, that stretches north to 72nd Street and that has several twin-towered buildings. The inspiration for the twin-tower buildings comes from the famous Art-Deco Period apartment skyscrapers on Central Park West such as the San Remo, the Majestic and the Century. The building has an impressive, large rotunda lobby, a concierge, a doorman, valet service, valet parking, a health club with half-court basketball, a children's playroom, a carriage room, a bicycle room, private storage areas, and state-of-the-art wiring. The 506-unit building is "pet friendly" and its main facade faces south. It was designed by Schuman Lichtenstein Claman & Efron. 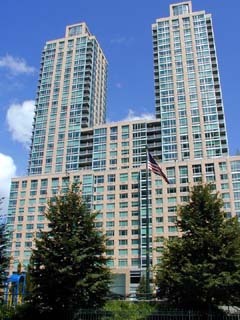 It is to the west of the large Lincoln Square apartment towers that are to the west of Lincoln Center. It is also not far from Columbus Circle.